Cresford Development is going to present a new tower at 42 Charles St E, the former YMCA building (across the street from Chaz condos). The Tower will stand 64-storeys in this Toronto’s most sought after Yonge and Bloor neighbourhood,the intersection of two subway lines. Mere steps to·the heart of Bloor-Yorkville’s upscale shops, fine dining and entertainment district. With the successful CASA at 33 Charles the past project, buyers anticipate the sales event. 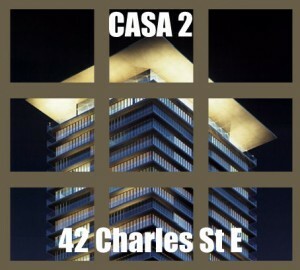 CASA 2 will be designed by acclaimed Peter Clews of Architects Alliance. Casa 2 will be a dramatic façade in the Yonge and Bloor neighborhood with spectacular views from spacious wrap around balconies. The 2 storey podium will make this tower a landmark in the Yonge and Bloor neighborhood with a soaring 20 foot ceiling furnished by Missoni Homes. Suit features include 9 foot smooth ceilings, spacious wrap around balconies and gourmet designer kitchens. This project has been highly anticipated and rumors are that VIP pricing are under $700 dollars a sq/ft. >>Contact me, to attend the VIP sales event.